I've had a recent burst of reading spy fiction. Partly inspired by the end of Spooks on TV and an endless fascination with security issues and the end of the Cold War. It's a genre that floats my boat far more than the current public's fascination with historical fiction. I mention all of that because David Chadwick's Liberty Bazaar shares that light touch intensity of the king of this genre, John Le Carre. Though set in Liverpool at the time of the American Civil War, it matches the claustrophobia of 1960s Berlin. The intrigue, the rules of engagement of espionage and the double dealing. Liverpool in 1865 was a city on the edge of an empire with conflicting interests in the American Civil War. The importation of cotton through the port was tricky enough, but the 20 miles of shipyards on either side of the Mersey also harboured ill deeds to construct warships. 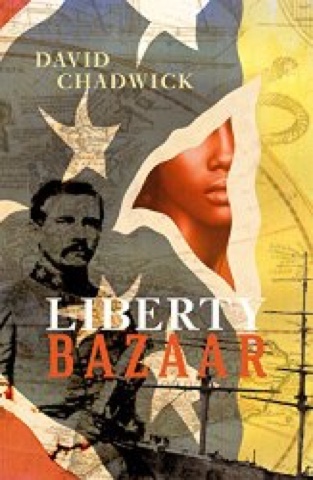 The Liberty Bazaar of the title refers to an actual event held in St George's Hall to raise money for Confederate prisoners of war. The hidden purpose was to fund warships to beat the Yankee blockades. Placing Liverpool at the heart of the story, 150 years after the end of the war, is a stroke of genius. That's the background, which is compelling enough, but the style is in itself the real triumph of the book. Bouncing between narrators it tells the tale through intertwined destinies of an escaped slave girl Trinity Giddings and a decent minded Confederate officer Jubal de Brooke who both end up in Liverpool. The other players in the story veer between outright treacherous and terrified self interest; the complexities of war blurring the boundaries between the good guys and the bad guys. It's corny I know, but I ended up casting the film of the book as I read it. Imagining Kevin Spacey as the villainous southern spy States Rights Rankin, a dashing Matthew McConaughey as Jubal and Naomie Harris as Trinity. This was a terrific read, funny, witty, clever, compelling and hugely informative about the forgotten role of our major port city in a moment of history.